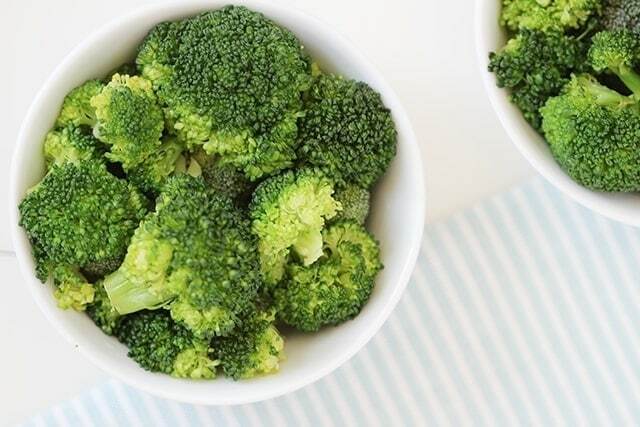 There are many ways to steam broccoli, and we are sharing some of them! Steamer basket, microwave, stove top, rice cooker, or instant pot. A key message at Super Healthy Kids is to let your kids try a variety of foods, prepared in a variety of ways. I haven’t been able to get kids to eat a food they didn’t like, simply by serving it 10-14 times. However, I HAVE been able to get a picky eater to try a new food by serving it 10 different ways. 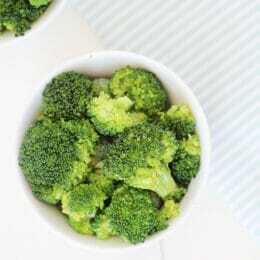 For example, broccoli can be served raw, roasted, blended, baked, mixed in with other things, and steamed! Each way tastes different and gives kids a different texture experience. So, don’t give up if you child doesn’t like broccoli raw or roasted. Keep trying different ways and recipes to cook it until you find the way they like it the best. Today, we’re tackling STEAMED BROCCOLI. The easiest way to steam broccoli is with a steamer basket (like this one). This method is popular because the broccoli doesn’t sit in the water at all. It relies on the steam to cook the veggies. This keeps the broccoli crisp and not mushy if cooked the right amount of time, which is helpful to anyone who is new to steaming. Place the steamer basket above the water level. Most steamer baskets have a collapsible design so they can fit in many different sized pots. 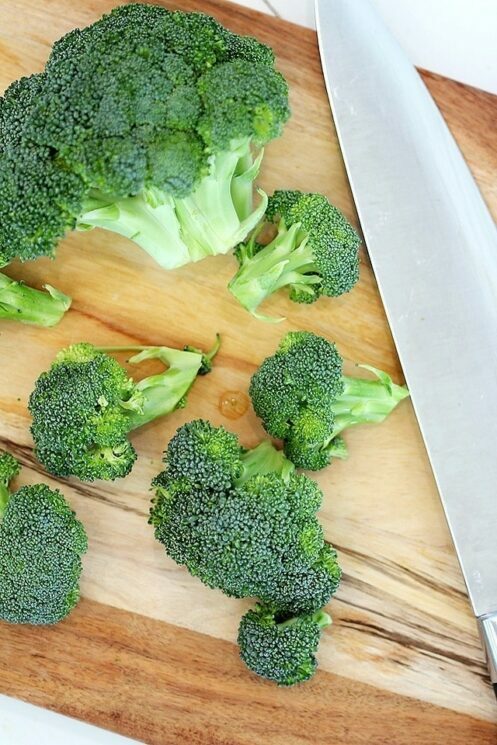 Cut your broccoli into small florets. Boil the water in the pot over medium high heat. Place the broccoli into the basket. Cover with a lid and continue to boil. You can cook anywhere from 4-8 minutes, depending on how crisp you like it. Use less time for crispier veggies. 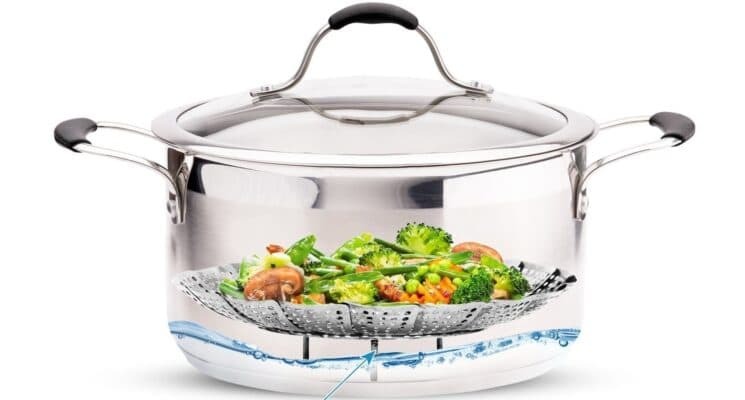 You can also use a steamer basket to cook a variety of veggies beyond broccoli, while your broccoli cooks! MICROWAVE: In full honesty, cooking or steaming broccoli in a microwave is actually the way I cook most often (even though I own the steamer basket!). Many people worry that the microwave destroys nutrients. Although some nutrients are lost during cooking, they are lost through all methods of cooking, it’s not limited to the microwave. There are still nutrients that remain, so it’s beneficial no matter how you decide to cook it, as long as you eat it. I always say, the biggest risk of not getting nutrients from a food, is just by not eating that food! To cook broccoli in the microwave, fill a microwave safe dish with a small amount of water (1/8-1/4 of a cup is all you need). Add the broccoli to the dish, and cover. Cook on high for 3 minutes. Remember, you are steaming, not boiling, the broccoli. So a small amount of water can do the job! RICE COOKER: I cook a lot of food in my rice cooker! My rice cooker came with both a steamer basket as well as a preset setting for steaming vegetables. It’s quick and easy, and takes about the same amount of time once the water is hot. Add a small amount of water to the bottom of the rice cooker. Place the basket inside. Add the chopped veggies to the basket. Turn on the rice cooker to the steamer settings, or just let it steam for 5 minutes. SKILLET: Before I got my steamer basket I always used the skillet method. Simply take a skillet and fill it with a very small amount of water. About 1/4 inch is all you want. Bring the water to a boil. Chop the broccoli and add to the pan and cover with a lid. There should be more steam in the skillet than water once it’s trapped in. Cook the broccoli for about 3-4 minutes. INSTANT POT: While this might seem like overkill, steaming broccoli in the Instant Pot is a great idea if you have lots of broccoli to cook. It’s not my favorite way to steam it because it’s easy to overcook and get mushy. To cook in the Instant Pot, add 1/2 cup of water to the bottom of the pot and top it with your broccoli. Select manual setting and set the time to zero. This will allow the steam to bring the pot to pressure, while cooking the broccoli. Once it reaches pressure, it doesn’t cook any longer. Cheese– Yes, we love cheese on broccoli, especially Parmesan or feta cheese! Garlic powder– You can also use real garlic or garlic salt. Either way, garlic compliments broccoli perfectly. Onion powder – You can also use real onion or onion salt. Oil (like avocado oil or olive oil)- Add after you steam the veggies, almost like a salad dressing. Lemon juice – Squeeze a little lemon juice on cooked or steamed broccoli after it’s cooked. It gives a fresh citrusy flavor. So, give some steamed broccoli a try. Let us know what your kids think! 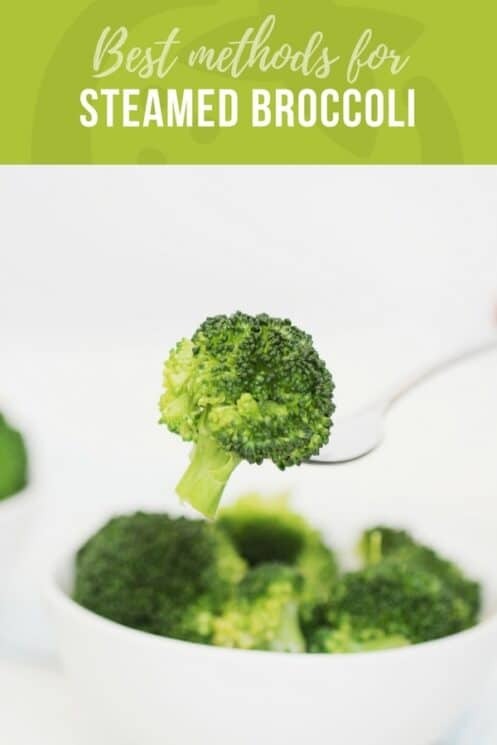 Place broccoli in a steamer basket over boiling water. Cover and cook for 4-5 minutes. While still hot, toss with salt and butter. Serve warm.